1. Santi Santamaría’s Santceloni restaurant, with two Michelin Stars, is located at 57 Castellana Walk. It offers Spanish gastronomic dishes, but gives each one a new air. With high quality as its maxim, Santamaria respects the product and its temporality. 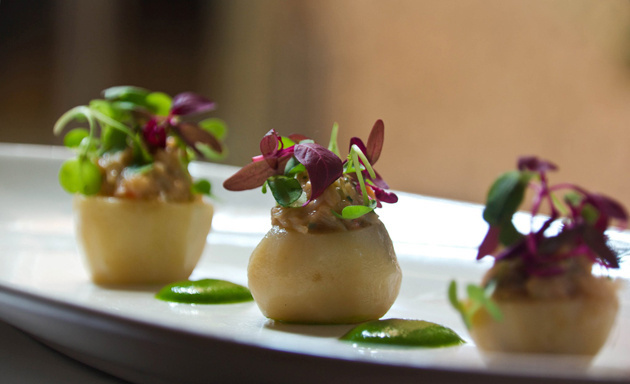 Chef, Óscar Velasco, bets on the freshness and the taste of each product. This is an experience. Splurge and enjoy! 2. With Ferran Adrià as gastronomic director and adviser, Paco Roncero, as chef, it is no surprise that La Terraza del Casino has been awarded two Michelin Stars. This rooftop terrace, located at 15 Alcalá Street, is in one of Madrid’s oldest and most exclusive clubs. The casino is a club for gentlemen, not gamblers, and is exclusively open to its members, while the restaurant is open to all. The originality, creativity, textures and new gastronomic molecular impressions combine succulent flavors and smells in every dish. Simply Marvelous! 3. At 31 Zurbano Street, we discover Sergi Arola Gastro, also holding two Michelin Stars. Sergi Arola, a student of Chefs Ferran Adrià and Pierre Gagnaire, is a proponent of traditional Catalonian and Mediterranean cuisine. Nothing is superfluous, rather flavors are authentic and the raw material is seasonal and nearly always locally sourced. Dishes include starters such as, Jerusalem artichoke with truffle poultry and mascarpone, mains such as red mullet with sautéed beans and peas with black pudding and a veil of Iberian ham, and desserts such as airy, light passion-fruit soufflé with mint ice cream. Inspiring & Sublime! 4. At 67 Claudio Coello Street, you will find Ramón Freixa Madrid Restaurant, where traditional dishes are transformed by a sophisticated and modern cuisine. Mediterranean style acts as the main character, from the decor which is postmodern Baroque, to the tableware of black water goblets and gold chargers! and finally to the mignardises served before dessert. Everything at Ramón Freixa Madrid is over the top. One could say this is a negative as in the case of heaping plates of hors D´oeuvres—a spoonful of spherified foie gras, a strangely matzoh-like cornet piped with chorizo cream, a lozenge of gelified cola—which are united only by their common diminutiveness. But it can also be very, very good. Why have a boring old salad, if you can match each raw vegetable with its dried-and-fried twin? Why content yourself with a rich, herby stew of sautéed wild mushrooms, when you can top it with sweet rounds of octopus, crisp rabbit ribs or tiny pancetta meatballs? Three cooking styles for the lobster, ten textures for the tomatoes, six kinds of chocolate with your coffee…Who said the age of excess is over? Exciting and terrific! 5. Finally, El Club Allard which holds true to the essence of ´private club´, as has been since its founding in 1998. More than ten years later, the simple but original recipes of Chef Diego Guerrero have awarded this restaurant with the grand Michelin Star. El Club Allard is located almost halfway between a park with a statue of Don Quixote and another park with an ancient Egyptian temple. The location may not have been deliberate, but it is somehow appropriate for a restaurant that manages to combine notes of mystery, fantasy, humor, imagination and creativity. There are a million good places to eat in Madrid, and more than a few Michelin-starred restaurants. But if you have three hours to spare for lunch, you really, really should go to El Club Allard. This meal will be talked about for years!